Have you ever stopped to notice how you might feel after eating a piece of birthday cake? A sandwich? A bowl of pasta? Pizza? Most of us don’t always take our time to mindfully ingest our food, and to notice how we feel while we are consuming it and also after we are finished. I don’t know about you, but when it comes to eating a piece of birthday cake, a giant chocolate chip cookie, a few slices of pizza, or a bowl of pasta, I tend to feel rather heavy and lethargic. Sometimes I even find I need to stop whatever social situation I am in, instantly, and lay down to take a nap, only to wake up with a somewhat unsettled stomach. There have even been a few times when I discovered that my skin started to take on less clarity and more blemishes. Not to mention, my mind which feels foggy, and my joints which are aching! As a nation, we have watched as obesity has become an epidemic. This is not only because of the processed and fast food that is readily available but also because we are not taking the time to think about what is in this so-called, “food”. What are we actually ingesting to feed and fuel our bodies? Often times, it’s a lot of gluten, sugar, dairy, or the processed version of these food items. Gluten is not bread, a pastry or pasta. However, all of these food items (if made traditionally) do have gluten in them. Gluten is the combination of two storage proteins (gliadin and glutenin) that are found in wheat and related grains (rye and barley). The gluten refining processing gives that chewy consistency to the food items that are regularly consumed by millions upon millions of Americans: pizza, bagels, breads and more. Gluten is often times even used as a thickening or stabilizing agent in things like sauces and salad dressings. It can often times even be found in ice cream! Read the ingredients carefully or look for the Gluten-Free symbol on your food if you have sensitivity to make sure you are not ingesting it unknowingly. After all, it’s hiding everywhere! This might surprise you, but nearly everything contains gluten! The few exceptions in our current food system are vegetables in their purest garden-fresh form, fish and grass-fed meats, nuts and seeds, and a few grains (quinoa, buckwheat, amaranth, millet, etc.). Gluten is nearly everywhere. Foods that contain gluten are not limited to pizza, pasta, pastry, bread, sauces (even soy sauce and tamari often times have gluten) and dressings. In fact, I am sorry to be the bearer of bad news, but beer and most traditional cereal are big time offenders. If you are curious about trying out gluten-free cereal, I highly recommend this delicious supergrains buckwheat and hemp cereal (I usually add berries or a banana, or on occasion raisins!). It is also very easy to make gluten-free granola by using gluten-free oats ! A recipe for GF granola is coming soon. There are lots of delicious and nourishing foods for people who have a medical condition that requires them to eat a gluten free diet. Common causes for this diet shift include a diagnosis of celiac disease or a gluten sensitivity (which you might not know is present until you try going without it!). However, there are also many people who are trying it out because they are health conscious or perhaps, just looking to experiment with food choices. This diet still enables one to eat fruits, vegetables, fish/seafood, meat/poultry, dairy, beans, legumes, and nuts. Certain grains, like those I mentioned above, and even, rice, may also be consumed. The one trick to remember when eating this diet, is that often times, gluten free foods that are imitations of “the real thing” (is it real, since it is likely highly processed? Just some food for thought…), are usually laden with a lot of unfamiliar ingredients to make it taste similar to the “real” thing, so it’s likely not healthier. A general rule of thumb that I try to follow is that if there are more than 3-5 ingredients and if there are several ingredients I cannot identify, I don’t eat it, even it is labeled Gluten Free. A common misconception is that a gluten free diet is a great way to lose weight. However, if you opt to replace the bagels, and pastas and breads, sauces, etc. that you once ate with their gluten free replicates, you likely won’t lose, and may actually gain weight. Eating a gluten free diet is really about eating more farm to fork, in my opinion. Some of the simplest and most delicious foods are naturally gluten free, especially when made in the comfort of your own home: sweet potatoes, beans, hummus, trail mix, almond milk (even regular milk and dairy products usually but be sure to check the label!) to name a few. Eating a diet that consists of naturally gluten free foods is also a way to reduce inflammation. If done naturally, this anti-inflammatory diet is not only better for the overall health of our gut, but may result in some weight loss, increased energy, and more clarity of mind. The benefits of eating this way are appealing when you approach it mindfully and from an educational standpoint! It may even help you reduce your skin inflammations, including acne! Wondering if you are intolerant or sensitive? This video shares some tips on how to find out if you should be reducing the gluten in your diet. Here’s to your curiosity and intrigue about your health! 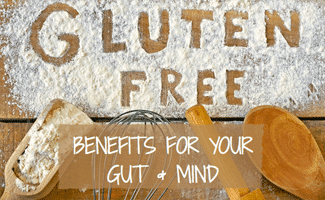 Experimenting with a gluten free diet, and reaping its many benefits both internally, and externally are sure to be rewarding. Why are you considering going gluten-free? Suzie Blackman was born and raised in Bethesda, MD and recently moved to Winston-Salem, NC. Suzie is a 200 Hour Registered Yoga Teacher and is a lover of all things health and wellness related. Growing up an athlete and dancer, Suzie has always been mind body oriented, but more recently she has seen the impact that a mindfulness practice has had on every aspect of her life. Suzie is especially passionate about food and nutrition because she views food as 'our most ancient form of medicine'. She hopes to evoke a sense of passion in you too, guiding you to think more about/question not only your food choices, but about how it is that you approach eating. What we put in, is what we get out. Let's treat ourselves compassionately, and with balance in mind. We believe that my daughter might have a gluten intolerance. This month, we want to try a gluten free diet to see if this will help her feel better. Like you said, it’s generally a good idea to look for between 3-5 recognizable ingredients in a product to ensure that it is safe to eat. Especially since my daughter’s birthday is this month, we will have to try and find a gluten free bakery for an alternative to a birthday cake. Thanks for sharing!